I love modifying things. It's a compulsion. Every car and motorcycle I've owned has been modded in one way or another. 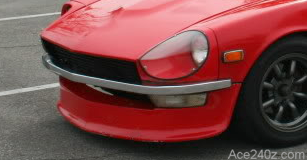 With this 240z, certain mods are must-haves. An air dam forces air to go around the car instead of underneath, where it can cause turbulence, which in turn can reduce the top speed. It also has an agressive appearance. I don't expect to need the type of performance an air dam provides, so I'm really only adding it for the right "look." Some air dams come with cooling vents for the brakes, but I prefer this smooth version. A spoiler quite literally "spoils" the flow of air over the back and keeps the rear end firmly planted for better handling. I love the style but have to admit it'll only provide useful downforce above 100 mph. Strut towers flex during hard cornering, especially when the metal is this old. A brace ties the towers together for better strength. Unlike the air dam and spoiler, this modification will help during day-to-day driving... such as when a soccer mom minivan pulls out in front of me and I swerve wildly to keep from being hit. 46 years of driving can take a toll. 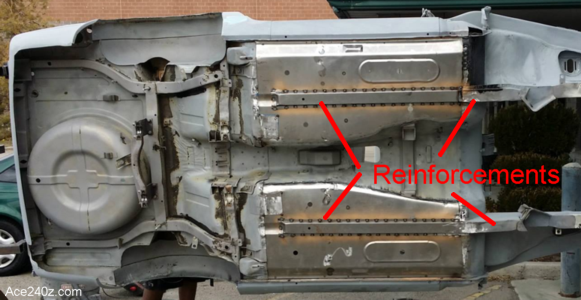 An underbody reinforcement kit (shown here on someone else's car) makes a huge difference. The result is a car that's stonger than when it came from the factory. The installation was exhausting and took a lot of work to get everything aligned and tacked into place. I'm wanted to hire a mobile welder to do the final work but ended up doing it myself. 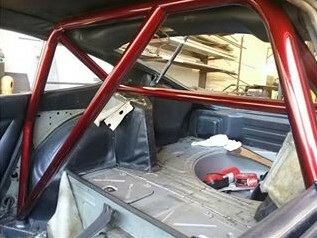 A roll bar isn't really needed for day-to-day driving, but if I get hit or somehow lose control, and the car flips over, the bar could be a lifesaver. The kit came in pieces and will need a fair amount of fabrication to fit right, but once it's done I'll have another great upgrade.